In stark contrast to the millions who died, only a few thousand are thought to have escaped from Nazi-occupied Europe once World War II started, crossing the Pyrenees to the Iberian Peninsula and then emigrating to third countries. About 15,000 Ashkenazi Jews escaped to freedom through Spain. The first refugees arrived in Spain shortly after war broke out, passing through border posts and travelling across the country to embark from Spanish or Portuguese ports. But this situation soon changed. Under pressure from Germany, the Spanish government restricted the issuing of entrance visas in those countries where clearly anti-Jewish international transit legislation remained in force. Those Jews arriving in the south of France without visas had to cross the Pyrenees clandestinely using mountain passes. Such escapes became epic adventures, full of drama: walking along endless tracks in cold, fog and snow, dodging French and German police patrols… Many fugitives had accidents, suffered from frozen extremities, or arrived totally exhausted after so much exertion. Sadly, others paid for this desperate attempt to flee with their lives. To ensure the success of these journeys, escape networks were set up to take Jews to Spain and Portugal from anywhere in Europe. These were run (above all in the later stages) by Spanish exiles living in the south of France and had collaborators in Spanish towns and villages on the borders with France and Portugal. People living near the borders and in small villages also showed great solidarity and worked intensely to help the refugees, many of whom were on the verge of dying. The Spanish government’s attitude to these Jews was ambiguous. Roads and lines of communication were closely monitored, and refugees were often arrested and charged with illegally entering the country as soon as they set foot on Spanish soil. They were then imprisoned. At the same time, the Spanish police also returned an indefinite number of them to France, sending groups back from time to time over a period of two years. 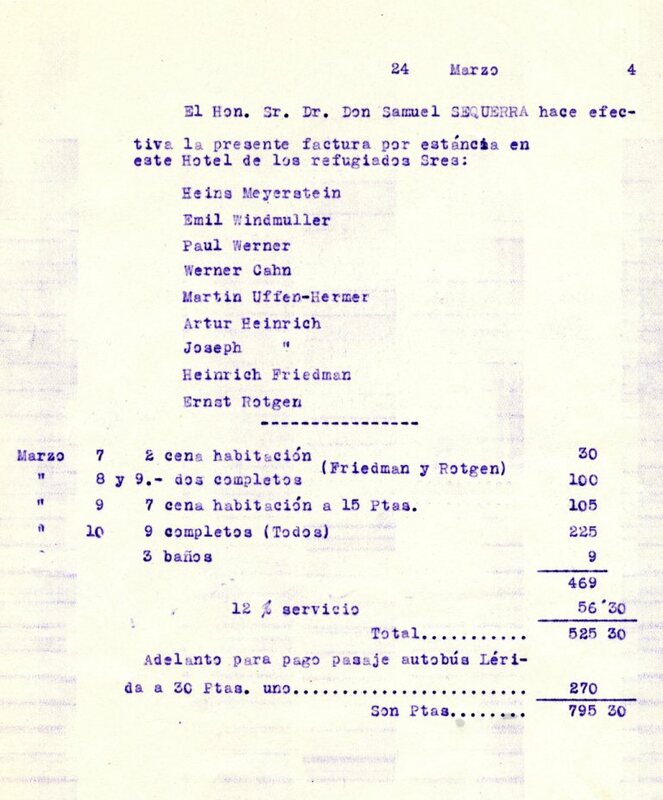 Documento de pago, a cargo de Samuel Sequera, representante del American Joint Distribution Comittee, de la factura de la estancia de refugiados judíos en el Hotel Pessets de Sort. Año 1944. (Familia Aytés). 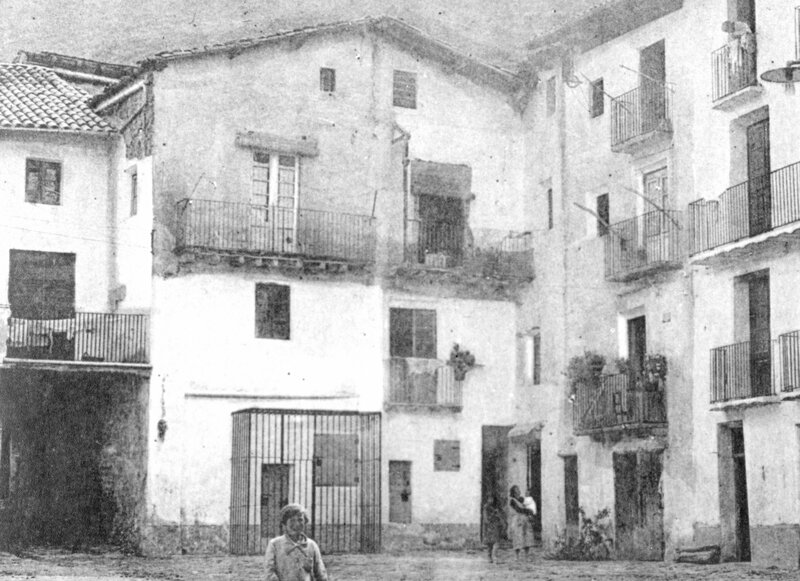 Most of the refugees picked up were received and held in small gaols in the Pyrenees and in provincial prisons. 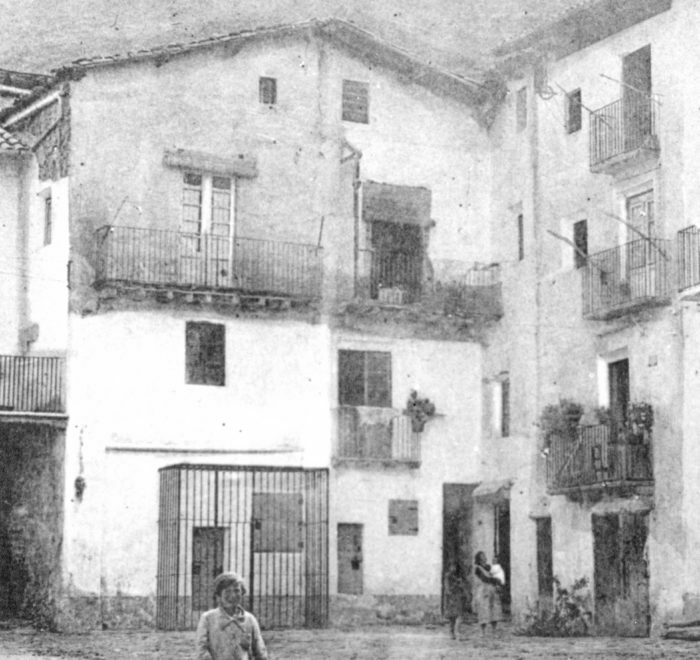 Men could be interned in the concentration camp at Miranda del Ebro, while women and children were usually released. Aid for these refugees was initially provided by the Allied embassies, but it did not become truly effective until the establishment in Spain of humanitarian organisations like the American Joint Distribution Committee in Barcelona and the American Friends Service Committee in Madrid. These entities had two basic objectives: to avoid the imprisonment of detainees and to facilitate their departure from Spain. 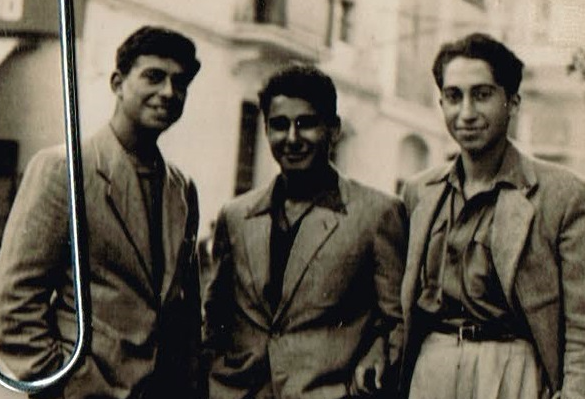 Little by little, they managed to assemble groups in Barcelona and Madrid until they were able to obtain visas to emigrate to the United States, England, Canada or Palestine. At last, the refugees could turn their backs on the persecution, the extermination camps and the gas chambers where so many of their friends, neighbours and loved ones had perished. Historian Josep Calvet Bellera(La Pobla de Segur, 1965) is the author of Huyendo del Holocausto (“Fleeing the Holocaust”) (2015, 2nd edition)andLas montañas de la libertad (“The Mountains of Freedom”) (2010), two works about the Jewish refugees who crossed the Pyrenees into Spain to escape persecution by the Nazis. Coordinator of the Camino de la Libertad (“Road to Freedom”) museum-gaol project in the old prison at Sort (Lleida), he has also worked as a consultant on Perseguidos y Salvados (“Persecuted and Saved”), an initiative launched by the Provincial Government of Lleida to preserve the memory of those Jews who crossed the Pyrenees into the province to escape the Holocaust. Mandred Bundheim y otros dos refugiados judíos en la ciudad de Lleida. Junio de 1944. (Joseph Ben Brith).